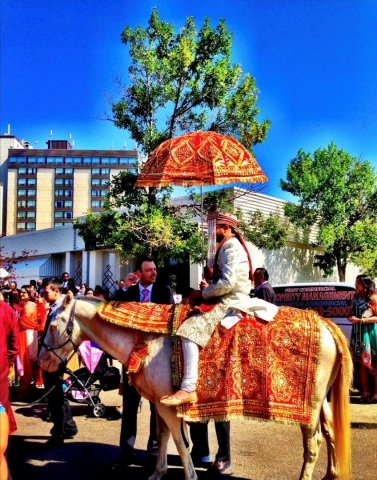 AWP Featured in the Calgary Herald for Horse: “Frosty the Wedding Horse is the go-to for South Asian weddings in Calgary”. Carriages for that very special wedding day! Horse drawn vehicles for any occasion! For East Indian Weddings, we can provide the White Horse for the ceremony. The cost for this service is $600.00 for the first hour, or part thereof, and $400.00 for the second hour, or part thereof, plus GST, within the Calgary area. There will be extra charges for out-of-town requests. 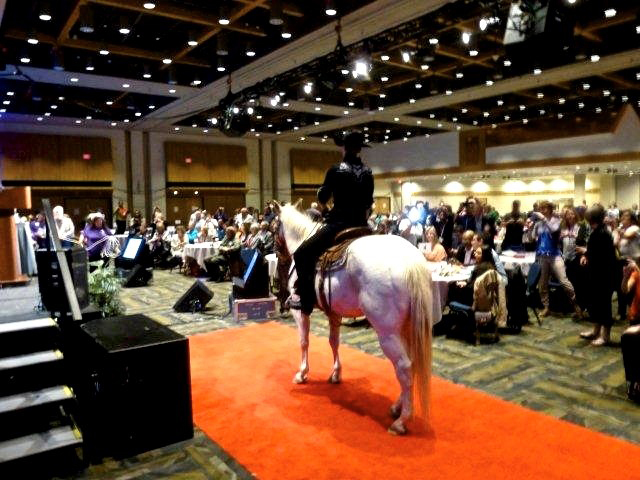 Decorations for the horse can be rented, picked up, and returned by the client from Ramesh at Apni Hatti (403-273-6905) in Calgary. We will place the decorations on the horse 15 to 30 minutes prior to the ceremony, when received from your representative. The client is responsible for the rental, pickup, and return of said decorations. A horse drawn hayride costs $650.00, plus GST, within the Calgary area, for up to two hours. For distances an hour or more away from us, within Calgary, there will be an extra charge depending on the distance. There will also be extra charge for out-of-town requests. 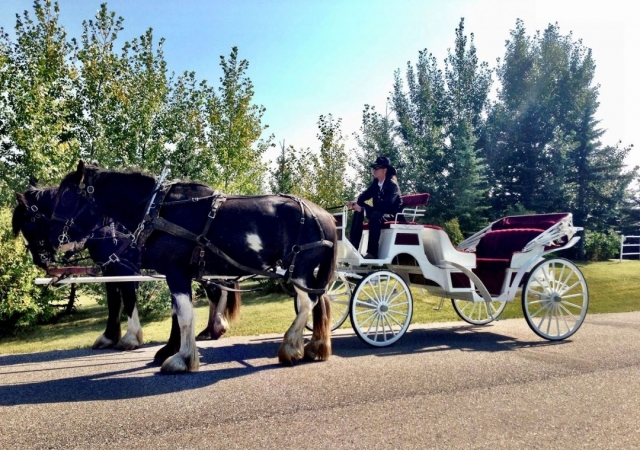 Two horses, driver & footman, fancy carriage – costs $1200.00, plus GST, within the Calgary area, for up to two hours. For distances an hour or more away from us, within Calgary, there will be an extra charge depending on the distance. There will also be extra charge for out-of-town requests. For all of our services, 50% deposits are required to reserve your booking. Please send this deposit, along with your written requests which include your name, address, phone, e-mail, date, time, and address for your event, and any special requests which you have discussed with us. The remainder of your payment is required one to two weeks prior to your event date. 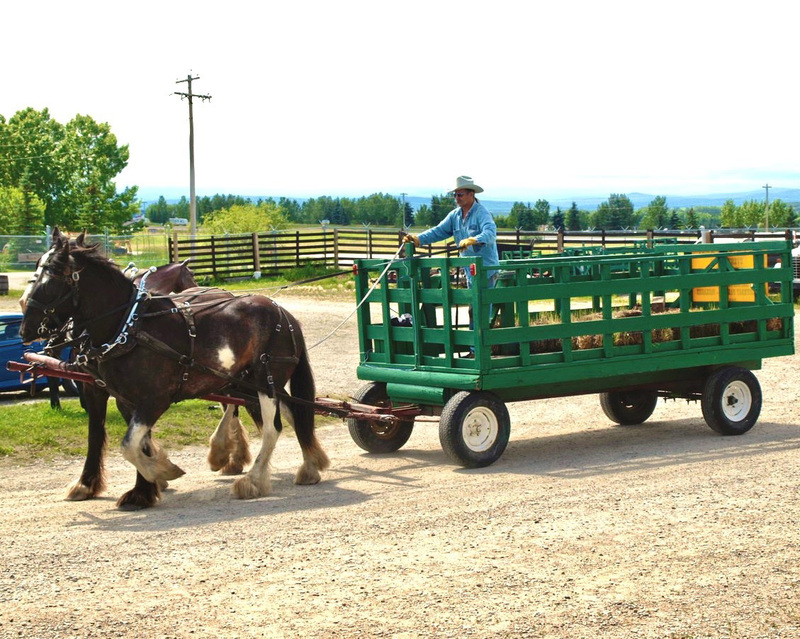 Please book your horse drawn activity at least two weeks prior to your event. Cancellations up to 48 hours before your event will require payment of 50% of the total amount. Cancellations after 48 hours will require full payment.